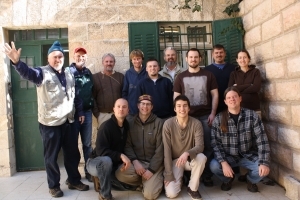 A group of sixteen facilitators and participants recently gathered in Jerusalem (Dec 28, 2011-Jan 6, 2012) to speak Koine Greek, while reading select New Testament texts associated with Jesus in Jerusalem and visiting the ancient sites connected with those narratives. The group gathered in Jerusalem’s Old City for over 50 immersion Koine Greek hours, interacting with stories, maps, props, and texts. 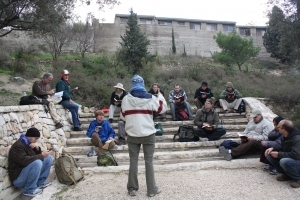 Communicative Language Teaching (CLT) techniques, such as TPR (Total Physical Response) and TPRS (Teaching Proficiency through Reading and Storytelling), were employed to prepare the gospel texts which were read on site. Occasional smaller groups led by facilitators allowed for more speaking practice and contextual communication. 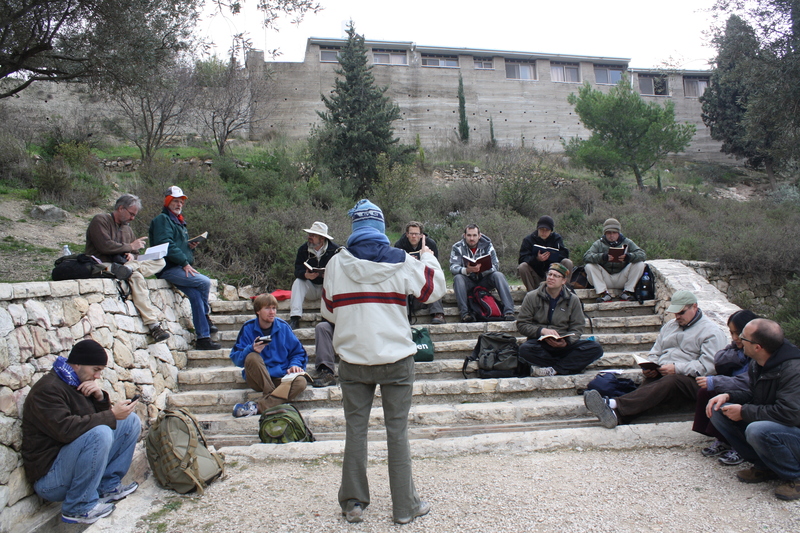 The first workshop trip was to the Mount of Olives, where Jesus’ triumphal entry (Lk 19:28-40) and Olivet discourse (Mt 24:3-14) were read and discussed while overlooking the Kidron Valley and the Temple Mount. Jesus’ prayer in the garden of Gethsemane (Mk 14:32-42) was read in an olive orchard on the mountain’s descent. The second workshop trip was to the southern part of ancient Jerusalem, also known as the City of David. There, at the pool of Siloam, discovered in the past decade, the group read Jesus’ healing of a blind man (Jn 9:1-41). Afterward, the group walked past recent excavations outside of Dung Gate and up through a newly opened tunnel into the Southern Steps of the Temple Mount. Texts associated with Jesus and the Temple (parable of the wicked tenants, cleansing the Temple, taxes to Caesar) were read later and discussed in their historical and cultural context. The third workshop trip began at the Western Wall of the Temple Mount, where the group entered an underground passageway into a great meeting hall from the Second Temple period. There, Jesus’ trial before the Sanhedrin (Mt 26:57-68) was read in the cavernous, low-lit room. Via tunnel, the group traversed the western face of Herod’s expansion of the Temple Mount, exiting where the great Antonio Fortress once stood. In the lower levels of the Convent of the Sisters of Zion, which still retains the Roman pavement stones from the ancient fortress, the group read Jesus’ appearance before Pilate (Mk 15:1-20). Afterward, the group visited the close-by Pool of Bethesda and read Jesus’ healing of the invalid (Jn 5:1-17). 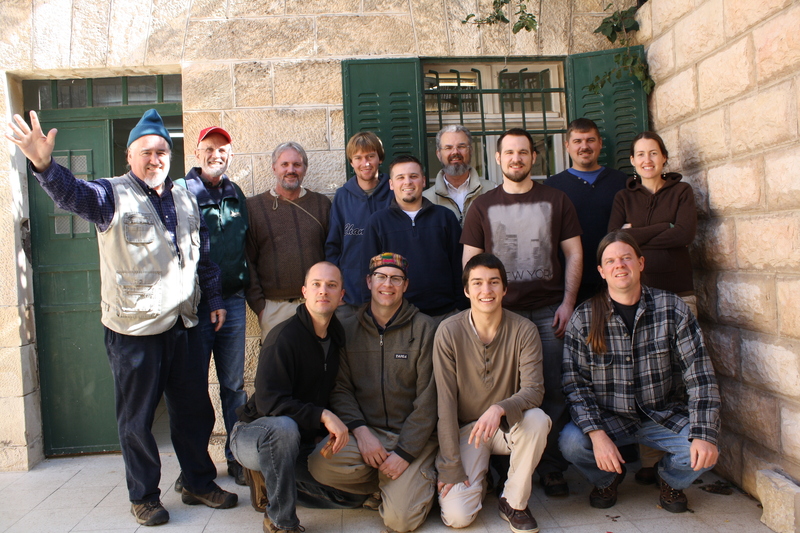 Beginning with the “Jesus in the Galilee” Koine Greek session (Apr, 2010), and then followed by the first “Greek Instructors Fluency Workshop” in Fresno (Aug, 2011), this recent gathering in Jerusalem was one more step in the Biblical Language Center’s goal of stimulating Koine Greek fluency among the academy and beyond. Moving forward, Fresno will host their second fluency workshop this July, 2012, and there are tentative plans for another Koine Greek workshop in Jerusalem (“Jesus’ Last Week”) with New Testament texts and field trips in March, 2013.
τοὺς μὲν οὖν λαλοῦντας Ἑλληνιστι βλέπων ἐχάρην. πάντα δὲ συνῆκα. χάριν οὖν ὑμῖν δίδωμι. ἔρρωσθε ἐν ὀνόματι Ἱησοῦ Χριστοῦ. Hello. I just went on an amazing trip to Israel for the first time with Jerusalem Cornerstone Foundation. I have a question. Why is Greek the language to learn instead of Hebrew? Would Jesus have taught in Hebrew? Would the disciples have written in Hebrew? I hope it is ok to ask this on this site. Any possibility for another ‘Jesus in Jerusalem’ workshop during the same period in 2013? March would conflict with some academic schedules whereas, almost all academic schedules have a vacation during the winter period you chose in 2012. I would really like to participate next year! We (BLC) recommend learning both Greek and Hebrew to a fluent level. Fluent speakers make better readers. As for Jesus and teaching in Hebrew, one of the little discussed phenomena about ancient Jewish teachers is that all rabbinic story parables are in Hebrew, even where the surrounding context is Aramaic. So yes, we can assume that Jesus taught in Hebrew, at least some of the time and probably most of the time. You might want to look at a blog that was just posted about the Bar Koseba letters. And yes, Papias testifies that at least Matthew wrote in Hebrew (which should not be equated simply with the Greek Gospel of Matthew). Filling in details would require an article or a book. We missed you in 2012. Keep pushing us. Meanwhile, we are working on organizing the Fresno workshop 2012. Ann–By the First Century Hebrew was a liturgical language not used in conversation and not always well understood when read aloud for worship. Glosses called targums, in the everyday language of Aramaic, which is related to Hebrew somewhat as Modern Dutch is related to Old English or Old High German, were used to make it easier and clearer. The likelihood is that most of the teaching of Jesus was in Aramaic. Galilee was cosmopolitan enough that he may have some degree of fluency in Greek. However, no manuscript of early Christianity survives in Hebrew or Aramaic, only in Greek. The closest thing may be the Aramaic of the Syriac Peshitta. Some scholars speculate that part of its text may represent a recollection of the words of Jesus in Aramaic, rather than just a translation from the Greek. So learning Koine and reading the NT in it is the closest we can get to what the first disciples and followers heard. Gerald’s comment represents the way that most people thought about 100 years ago and before the field of mishnaic Hebrew studies had developed. Better linguistic studies and discoveries over the past century have changed those old views. Many predictions/expectations of that old model were wrong, e.g., at Qumran we have lots of Hebrew Bible mss., quite a few Greek mss from all over the Bible, but virtually none of Aramaic (only a targum of Job from an Eastern venue, and a piece of Lev 16 that may have been part of a pilgrimage reading). But Qumran did have other Aramaic writings and were not against bible translations, per se, but they did not use an Aramaic Bible. Contrary to the ‘olde perspective’, Hebrew was both a high language and a low language in the first century, that is, it had a written register (like high German [cf. Qumran writings, background to Maccabees, et al.]) and a low register (a spoken register, like Swiss German [compare some Judean Desert texts, tannatic rabbis, graffiti]). There is a volume in press at Brill that will be collecting several articles on this subject. It should be out by the end of 2012 or early 2013. In the meantime, if you are reading Hebrew, you might enjoy the collection of Jewish story parables by Safrai and Notley. They made a complete collection of tannitic parables accessible for common readers.